No matter what festivals you celebrate, Christmas, Yule, Hanukkah, Solstice, festival of light, Diwali, this is a time of year where many of us celebrate the joy of light overcoming darkness, of exchanging gifts, and spending time with family, friends and loved ones. ♥ This is my gift to you, a placemat and coaster to make your table beautiful or a wall hanging mandala to show off your skills. ♥ I wish you all a peaceful festive season, filled with love and kindness, may giving bring you untold joy. Because I was making this as a Christmas gift for you all, I chose to use traditional christmassy colours, but as you will see it also looks amazing in any other colours. ♥ When making placemats and coasters, I personally recommend that you use cotton yarn. Cotton will stand up to heat better and is more absorbent than acrylics. I used a mix of Stylecraft Classique Cotton – White, and Paintbox Yarns in Evergreen and Red Wine. Both come in 50g balls and are Double knitting weight, I used a 4mm Clover Amour hook. Paintbox yarns are available from Love Crochet, please use the link on the righthand side of this page. Finished size is: Placemat 14 inches/35cm, and Coaster 5 inches/12.5cm. For a wall hanging you can use what ever yarn you like, I used Stylecraft Special Double knitting in Lipstick, Green, and White, with a 4mm hook. And it looks gorgeous above my little festive tree, and next to the beautiful Noel cross stitch my Mum made. Finished size for the wall hanging is 15 inches/38cm. Here are some of the Oh Tannembaums made by my amazing team of testers. ♥ Pauline Vos used Stylecraft Special in Cypress, and Claret with Stylecraft Batik in Cream. using a 4mm hook the finished size is Placemat 13 inch / 33 cm, and Coaster 5 inch / 13 cm. I love the softness of these colours, and the gorgeous little Christmas Angel. ♥ Ineke Mooijenkind used up some scraps she had left from old projects, these do make great stash buster type projects. Here is the placemat and coasters in her famous “Happy Colours”. And another signature colour set for Ineke is black and white for this stunning wall hanging. ♥ Terena Todd went for making a dream catcher, she also used up some left-overs in 3-ply, for a smaller piece. Just waiting to have the feathers and beads attached, I will add another photo once finished. ♥ Melissa Leighton decided to be a little different and has used hers to cover a stool for her she-shed, where she spends hours of fun hooking away. Melissa used worsted weight yarn and a 5mm hook, she made the extra rounds to create a circle of 16 inches, and used 202m/221yds of yarn in total. ♥ Becky Callahan has used christmassy colours, but in a different order to mine. I love the way the coaster reminds me of candy canes. Again made in worsted weight yarn with a 5mm hook, the placemat is 16 inches across, and the coaster is 6 inches. and many blessings to you all. Yarn usage and size: Dk 4mm hook 151 m – 165 yds. 35cm/ 14 inches. Aran/Worsted 5mm hook. 187 m – 204 yds. 41cm/16 inches. Yarn usage and size: Dk 4mm hook 38 m – 42 yds. 12.5cm/ 5 inches. Aran/Worsted 5mm hook. 30 m – 33 yds. 15 cm/ 6 inches. Wall hanging will need a few more meters/yarns of each colour. Dc Cluster: Yo, place hook into indicated st/sp, yo and pull up a loop, yo and pull through 2 loops, 2 loops on hook. Repeat twice more in same st, 4 loops on hook. Yo and pull through all 4 loops. Beginning Dc Cluster: Chain 2. Yo, place hook in same st/sp, yo and pull up a loop, yo and pull through two loops, 2 loops on hook. Repeat in same st, 3 loops on hook. Yo and pull through all 3 loops. 2Trtog: Yo twice, place hook in stitch to be worked and pull up a loop, 4 loops on hook, yo and pull through 2 loops twice, 2 loops on hook. Repeat in same st, 3 loops on hook. Yo and pull through all 3 loops. Fptr2tog: Yarn over twice, insert hook under front post of stitch to be worked, yarn over and pull up a loop, yarn over and pull through 2 loops twice, leaving 2 loops on hook, repeat for other leg of st and then yarn over and pull through all 3 loops. V stitch: (dc, ch 1, dc) in same st/sp. Sc3tog: Place hook in stitch to be worked yo and pull up a loop, 2 loops on hook. Repeat in next 2 sts, 4 loops on hook. Yo and pull through all 4 loops. (dc, ch 1) 7 times. Join to 3rd ch with a sl-st. Do NOT pull up magic ring. Stitch count: 8 dc, 8 ch-1 spaces. (ch 2, skip next ch-1 space, V-st in next st) [P2] 8 times, omit last V-st.
Stitch count: 8 V-st, 8 ch-2 spaces. Stitch count: 8 dc, 8 sc. (dc in next st, 2 dc in next st) [P2] 8 times, omit last 2 dc. [working over ch-2] 2 dc in next 2 sts) [P4] 8 times, omit last 4dc. Join to top of ch-3, fasten off, pull up magic ring, and secure all ends. (fptr2tog around next 2 sts R2, sc in next 6 sts) [P2] 8 times, omit last sc. Stitch count: 48 sc, 8 fptr2tog. (skip next 2 sts, 7 dc in next st [fptr2tog], skip next 2 sts, sc in next 2 sts) [P2] 8 times, omit last sc. Stitch count: 16 sc, 8 points of 7 dc each. (dc in next 3 sts, in next st (2 dc, ch 2, 2 dc), dc in next 3 sts, sc in next 2 sts) [P2] 8 times, omit last sc. Stitch count: 16 sc, 8 points of 10 dc, 1 ch-2 space each. Hint: Place stitch marker in ch-1 point space of small points, when working back loop stitches, also work in 3rd loop to keep stitches more stable. Join to standing blsc, fasten off, and secure ends. Stitch count: 4 small points with 2 sc, 10 blsc, 1 ch-1 point space each, 4 large points with 8 dc, 6 ch-1 spaces and 1 ch-2 point space each. Hint: over the next few rounds, take care not to skip the 1st hidden st after point spaces, when working back loop stitches, also work in 3rd loop to keep stitches more stable. Stitch count: 8 sc3tog, 4 small points of 10 sc and 1 ch-1 point space each, 4 large points of 8 sc, 4 tr, 4 bltr, and 1 ch-2 point space each. Stitch count: 8 sc3tog, 4 small points of 10 sc and 1 ch-1 point space each, 4 large points of 18 hdc and 1 ch-2 point space each. Stitch count: 4 small points of 10 sc, 1 ch-1 point space each, 4 large points of 14 sc, 2 tr, 8 fptr, 1 ch-1 point space. Stitch count: 4 small points of 7 sc, 4 large points of 17 sc, 8 groups of 3 2trtog and 2 ch-1 spaces. Stitch count: per repeat: 14 sc, 20 tr, 6 fptr. Repeat from * to* 4 times, omit last 3 sc. Stitch count: per repeat 9 sc, 2 dc, 1 fpdc, 26 bpdc. Repeat from * to * 4 times, omit last 5 sc. Stitch count: per repeat: 17 sc, 3 shells of 7 tr each. Stitch count: per repeat: 17 sc, 14 bpsc, 7 bpdc. Repeat from * to * 4 times, omit last mini repeat of 7 dc-clusters. Stitch count: 20 sc, 12 fans of 7 dc-clusters and 6 ch-1 spaces each. Join to standing sc, fasten off. Stitch count: 12 sc, 12 fans of 12 dc, 7 fpdc each. For placemat stop at this point. For wall hanging continue to follow instructions below. To make the wall hanging you will need a hoop approx. ½ inch or 2 cm larger than your final round, this will allow a little stretch to your piece and ensure it does not sag in the hoop. You can also follow these final few rounds if you want to create a mandala or circular piece. Hint: you will need to work in back loop and 3rd loop to keep your stitches stable. Repeat from * to * 12 times, omit last blsc. Stitch count: 12 blsc, 24 blhdc, 24 bldc, 12 tr, 72 ch-2 spaces. Hint: work away all ends, as it will be more difficult once mounted on hoop. 22. Join with a standing sc in dc made into tr above any point [P1] [this will ensure your piece hangs correctly], sc in next 227 sts. Ch 20, turn and working into back bump, skip 1st loop, hdc in next 19 loops. Fasten off, and using a yarn needle use ends to secure end of loop to back of work. Follow placemat instructions to R7, fasten off, and secure ends. (dc in next st, fpdc around same st, (bpdc around next st, fpdc around next st) 3 times, dc in same st as last fpdc, sc in next 2 sts) [P2] 8 times, omit last sc. Stitch count: 16 sc, 8 fans of 2 dc, 4 fpdc, and 3 bpdc each. This is so lovely – thank you! My crocheting is a bit rusty, will someone be doing ayoutube of the process? Thank you, Helen! This pattern is another winner. This is gorgeous Helen! Thank you so very much; it’s quite generous of you! Merry Christmas! Thank-you Helen, these are beautiful! Thank you for this beautiful pattern. We wish you a Merry Christmas and happr New Year. Thank you for all the beautiful patterns you are a real inspiration. 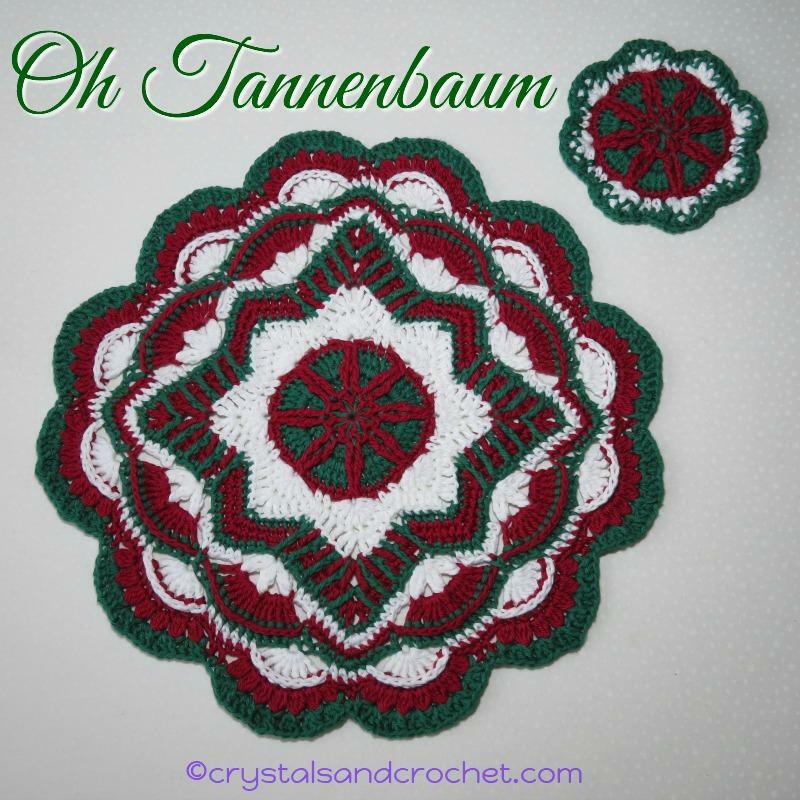 Do you have a pattern / colors for the mandala on your blog from today? Beautiful….I just love it. Thank you so much for designing us a present. I can hardly wait to make it!! Its v very beautiful token of your love. Thank you Helen for this beautiful pattern. Christmas blessings to you also.